Property 4: Prime Location - Sweet Traditional Home Away From Home, Family friendly! Property 6: A charming cluster of 5 renovated trad modern houses, Max 30 ppl, "Uan/Hana"
Property 17: Komachiya Kyoto traditional townhouse near Gion- with perfect location! Property 23: A guest house that renovates an old townhouse in Fushimi-Inari, Kyoto.One of all three rooms.Room for up to 2 people. Property 25: A guest house that renovates an old townhouse in Fushimi-Inari, Kyoto.One of all three rooms.Room for up to 4 people. Property 28: A guest house that renovates an old townhouse in Fushimi-Inari, Kyoto.One of all three rooms.Room for up to 6 people. 3 stop from Kyoto.8min walk JR Inari. Property 34: 3 stop from Kyoto.8min walk JR Inari. 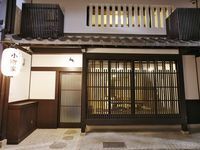 A Traditional Kyoto Machiya House With Modern,Japanese Antique Facilities. Property 38: A Traditional Kyoto Machiya House With Modern,Japanese Antique Facilities. 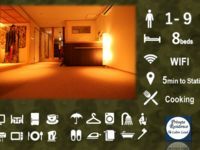 Property 42: 5mins to Kyoto Station&Gion - Machiya Botan. Renovated modern traditional house 5mins-walk from station, "Uan/Hana"
Property 50: Renovated modern traditional house 5mins-walk from station, "Uan/Hana"
Overall, we were very happy with the house. There was plenty of space for all 5 of us. The location of the house was ideally located to get around Kyoto and subways. The only comment was that the upstairs bathroom sink was leaking and really could not be used although the owner tried to fix it by using tape. It was fun getting hot can coffee from the vending machine across the house.